Still planning your curriculum for the year? 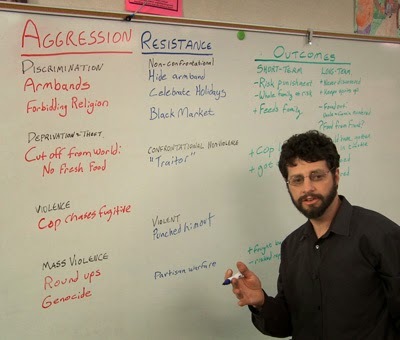 JPEF's new Tactics of Resistance is a framework you can use throughout the year to help students analyze conflicts and brainstorm solutions to violence and other forms of aggression. 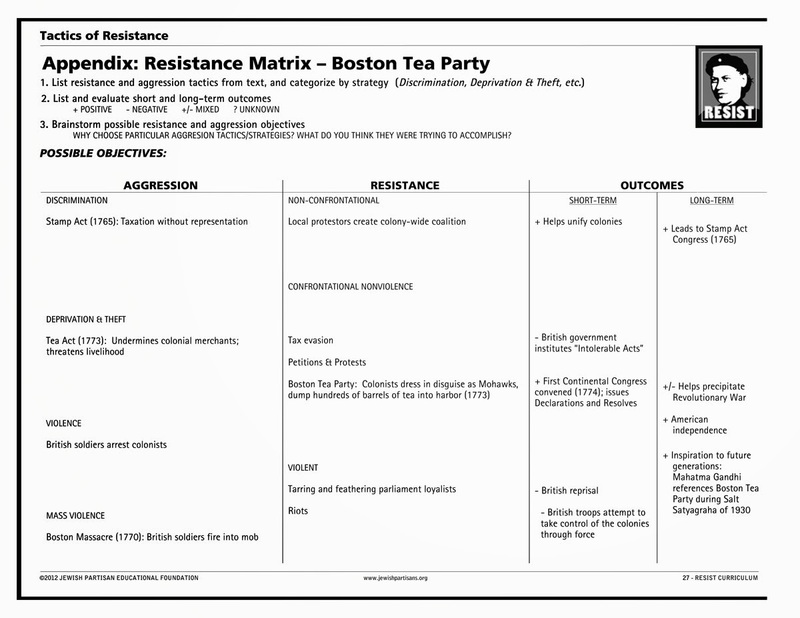 At the heart of the Tactics curriculum is the Resistance Matrix, a new tool that helps students think critically about aggression, resistance, and long- and short-term outcomes. Once students get the hang of the matrix, you can use it to brainstorm solutions to other situations (personal, community or global). You can also apply it as an analytic tool throughout the year in history, current events, literature, and even religious studies classes. 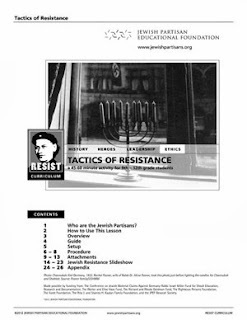 Concepts, critical thinking questions, and other materials from the lesson (such as the Tactics List and the Jewish Resistance Slideshow) will help you frame and examine subsequent conflicts your students study in your class. Feel free to let students be as creative as they can as they generate possible responses to aggression. By following off-the-wall, or even violent tactics to their conclusion, students naturally come to see the downsides and unintended consequences of outsized ('asymmetric') responses. On the other hand, after looking at the practical consequences of inappropriate solutions, we like to ask students for out-of-the-box solutions; something “so crazy it just might work”. These proposals can often lead to useful approaches. In one class, a student proposed bribing his sister to stop her from sneaking into his room and reading his diary. This led to another student suggesting they ask why she was acting this way, instead of simply arguing. Perhaps his sister was angry about something he did, or was simply curious, or actually wanted his attention. By considering her possible motivations, the student saw an option to be less reactive. Once students see how the matrix can help them think through their responses, you can encourage them to use it as a planning tool for creating positive change. 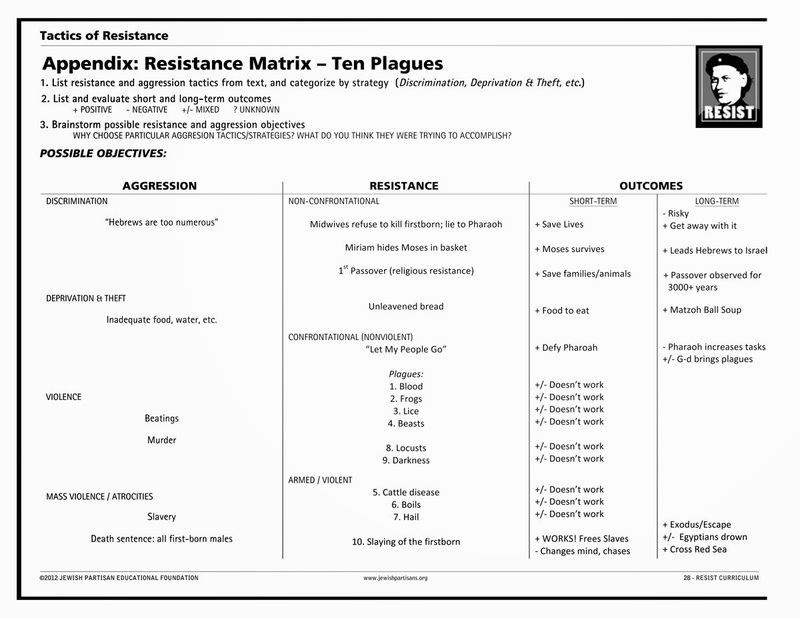 Use the Aggression column to help the group define the actual problem, and brainstorm large-scale solutions in the Resistance column (e.g: holding non-violence trainings to help students deal with bullying at school). Take the most popular solutions and break them down into smaller steps, assigning each to a different team who will envision possible consequences (positive and negative) for each point in the process. 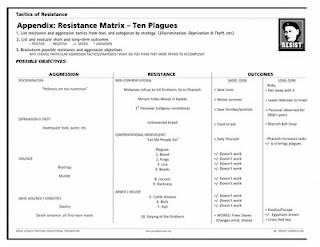 Teams can use a fresh matrix to troubleshoot and improve, then reconvene with the rest of the group to put their proposals together into a larger action plan. Students often misconstrue events in their own lives and categorize them as “aggression”, when in fact it's simply a matter of disagreement. That's why the lesson begins by working with the students to define Aggression and Resistance before introducing the matrix. Helping students differentiate between conflicts and true examples of aggression also helps students think critically about authority figures and the imposed limits they encounter in their own lives. 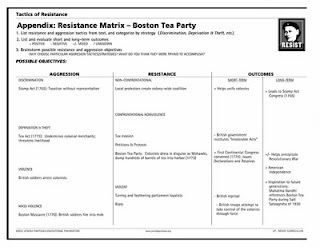 The Resistance Matrix offers students the opportunity to see both the short and long term consequences of an action or event. It is a tool that especially supports visual learners. 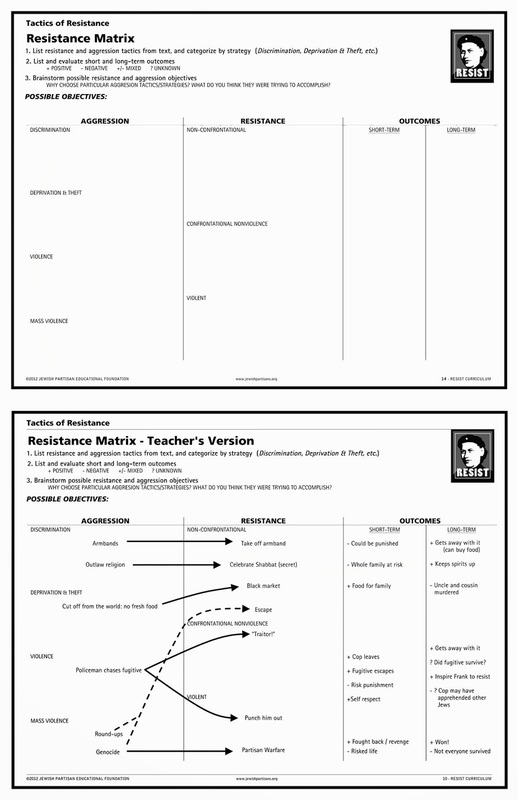 To highlight this effect – as well as to help non-visual learners keep track of the various categories – try color-coding student responses so that “Aggression”, “Resistance”, and “Outcome” categories each are written in their own color. See our entire Tactics of Resistance online course (running time: 43 minutes) for more tips and ideas to help you use these tools throughout your school year. 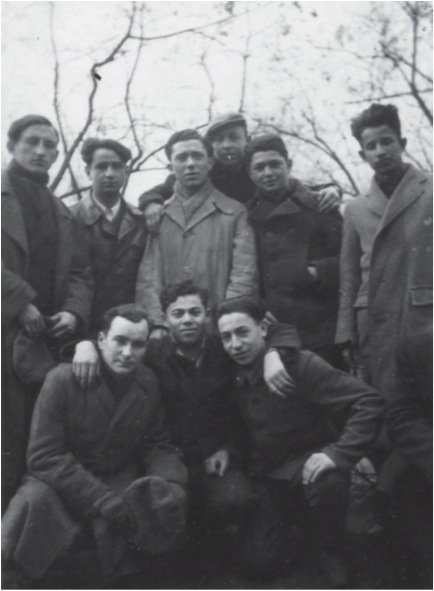 This Fall you can use social media to engage your students by connecting them with classes across the country to analyze and explore the new Jewish partisan memoir, If, By Miracle, by Michael Kutz. 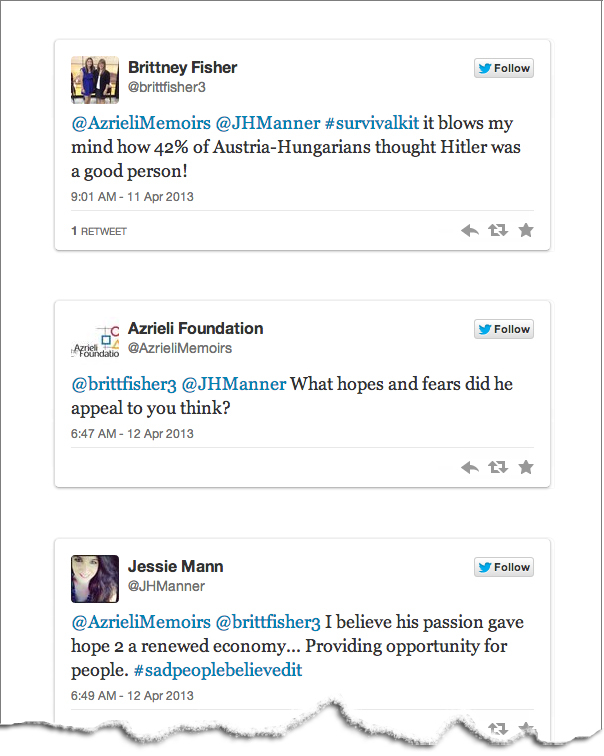 The Twitter Book Club, a real-time online conversation – hosted and moderated by the Azrieli Foundation's Holocaust Survivor Memoirs Program (HSMP) – brings reading alive through social media. Students share their research, reactions, and reports in class or after school. JPEF is providing classroom materials and joining forces with HSMP to supplement student conversations with links, "Ask the Expert" sessions, video testimonials, archival photos and other resources. Participating classes receive free copies of If, By Miracle plus JPEF DVDs, curricula and posters. Optional JPEF online courses are also available for teachers and students. If, By Miracle is the gripping account of Jewish partisan Michael Kutz, who at age 10 narrowly escaped the Nazi death squad that murdered his family. Determined to survive, he became the youngest member of a partisan resistance group, taking part in daring operations against the Nazis and their collaborators. Students in participating classrooms can follow us @AzrieliMemoirs, using the hashtag #IfByMiracle, to immediately contribute their ideas and emotional responses to an ongoing dialogue, adding real-time creation and collaboration to the reading process. This social-reading initiative brings learning into a medium and setting in which today's students are confident and capable. 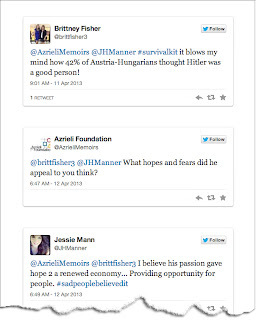 It puts a host of relevant, intelligent and thought-provoking multimedia content at their fingertips, creating a dynamic new engagement with the survivor's story and Holocaust education. 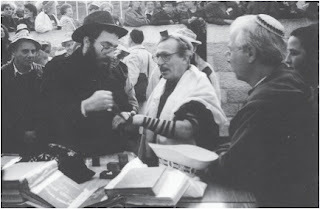 Tefillin being wrapped around Michael’s arm in preparation for his bar mitzvah. Jerusalem, 1990. 1. Michael at age thirteen in his hometown after liberation. Fourth from the left, he and the small group of Nieśwież survivors are standing in front of the town’s destroyed main synagogue. Nieśwież, circa 1944. 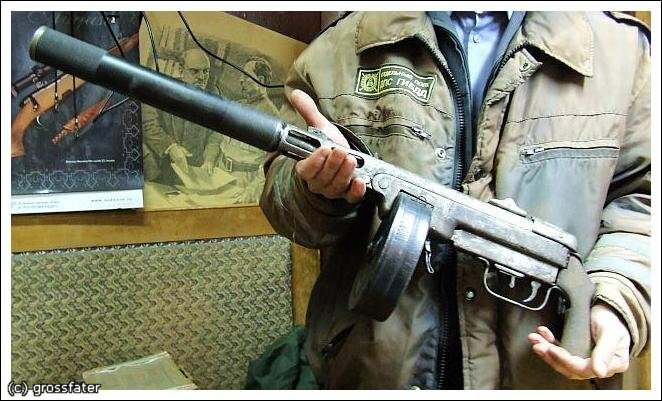 Photo courtesy of Yad Vashem. 2. Michael (front row, on the right) with the partisans. 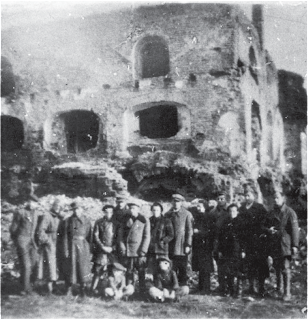 Lodz, circa 1945.